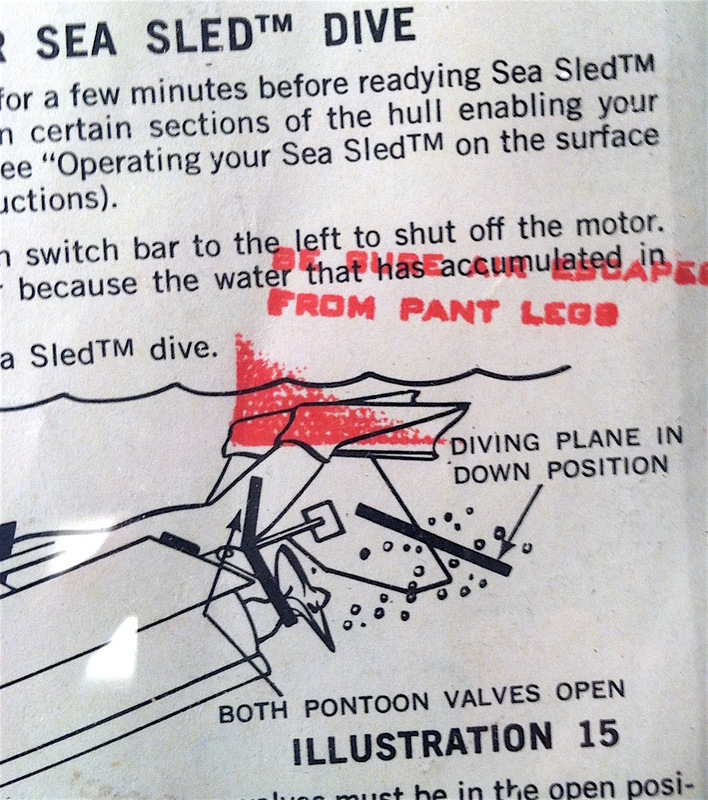 Dust to Dust— This unusual 2-color variation of the vintage (1966) GIjOE Sea Sled instruction sheet is now clearly showing its age. The left side has been eaten away (yikes!) by tiny insect bite holes and yellowing is overtaking what was once bright, white paper. Regardless, this fragile, folded page remains an exciting find for any fan and/or collector of GIjOE “ephemera.” Its belated addition of red type and graphics describing solutions to dealing with salt water damage, lost pontoon gaskets and escaping air from a scuba diver’s “pant legs,” make it very desirable and collectible. Original versions had none of this material, and intermediate versions had only a hand-applied stamp referring to those pesky pant legs (see at bottom). This third version was likely written, revised and then reprinted after early consumer feedback (and complaints?) made the additions necessary. In this condition, the ancient instruction sheet (50 years old!) now looks and feels like a treasure map— to GIjOE’s past! (Photo: Mark Otnes) Click to enlarge. 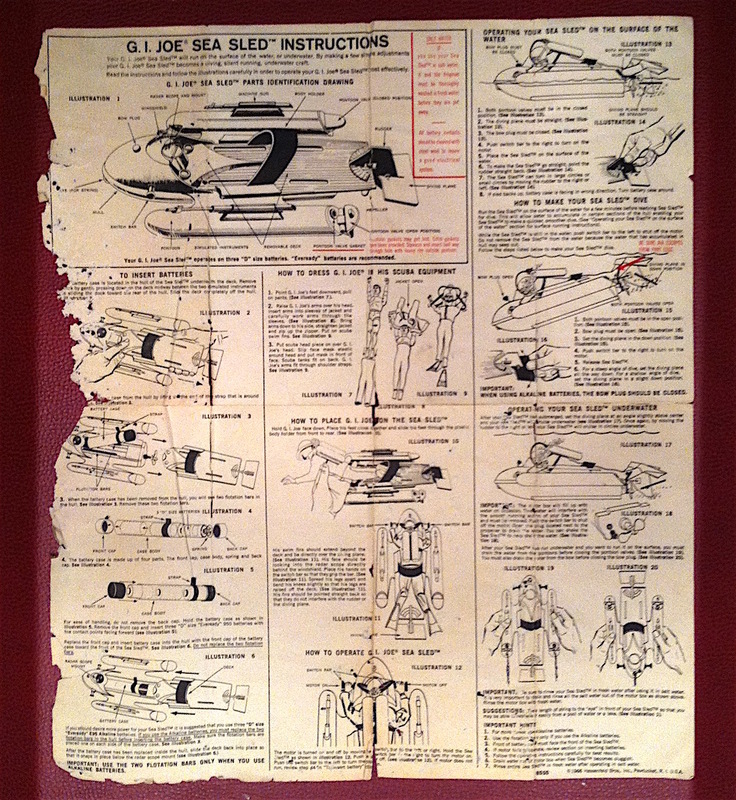 I’d received a customer request recently asking for an original (or reprint) of a vintage 1966 GIjOE Sea Sled instruction sheet. I didn’t think I had such a thing, but I promised him that I’d look into the matter and search through my personal GIjOE collection to see what (if anything) I could find. If nothing else, perhaps I could scan or photograph my precious framed copy and send him a photo? Lost at Sea— What would happen if you placed your Sea Sled out in the ocean? Say goodbye to your Scuba Joe, that’s what! The sled’s anemic, battery-powered motor would have no chance of keeping up with oceanic tides and/or wave pressures. Your 1:6 watercraft would be gone in seconds, probably never to be seen again. BUT…if you were so foolhardy as to have attempted such a voyage, at least your trusty “salt water” variation of the Sea Sled’s instruction sheet would’ve reminded you what to do when you got home. Yes, that’s right—WASH IT! As this closeup reveals, the so-called “saltwater” version of the 1966 instructions included (newly inserted) red type in a bold box. (Photo: Mark Otnes) Click to enlarge. After sifting through piles (and piles!) of my miscellaneous GIjOE “ephemera” collection (i.e. paper goods such as flyers, ads, instruction sheets, etc. ), I finally came across the sadly decaying, fragile page you see photographed above. Now over 50 years old(! ), this forlorn instruction sheet has clearly not been well cared for. Numerous insect (or mice?) bites have eaten away at one side, splits and tears run along its fold lines, and just holding it in my hands made me feel it was falling apart. 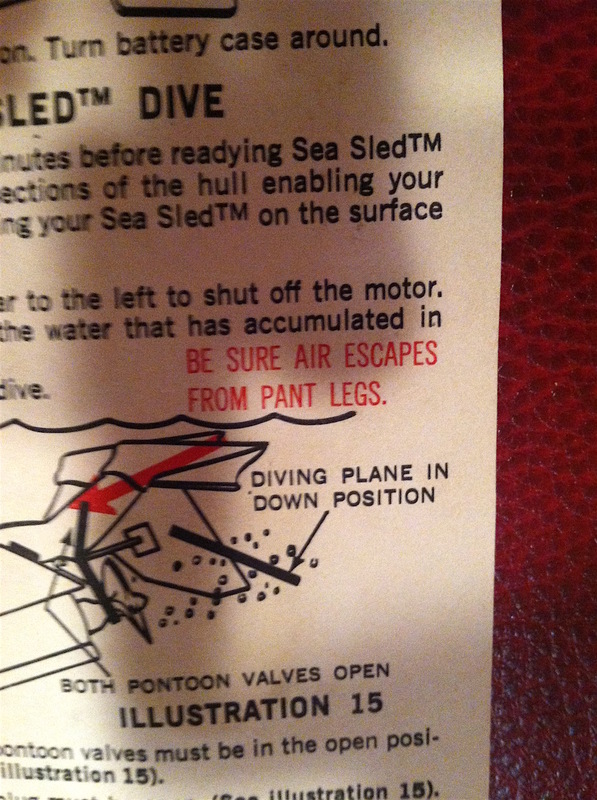 Was Joe Cutting the Cheese?— This red addition to the rare “salt water” variation instruction sheet reminded its owner to allow air to escape from the scuba diver’s “pant legs.” Just what was going on under those frogman wetsuits? HA. Perhaps children complained they were having trouble getting Joe to sink down in their pools or bathtubs. Otherwise…P-U! (Photo: Mark Otnes) Click to enlarge. Stamp Me Sea Worthy— This super-tight closeup of my framed (non-saltwater) instruction sheet shows that the only red type added to this earlier version clearly came from a hand-applied rubber stamp pad, most likely pressed on AFTER the page had been printed. (Photo: Mark Otnes) Click to enlarge. 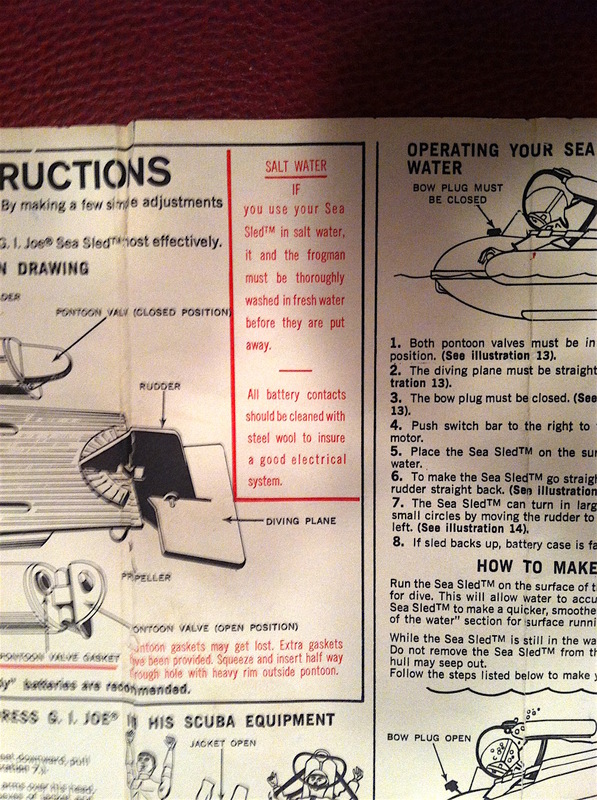 Bottom Line: I do own a second vintage Sea Sled instruction sheet that was lovingly framed and preserved under glass long ago in near-mint condition. Sadly, it lacks most of the “red” text additions apparently added to later saltwater versions. This unusual variation has been in my basement stacks for years, but I only really acknowledged and studied it closely today. Hmm… I wonder if my customer would prefer a photo of a (bug-eaten but rare) saltwater variation or a nearly perfect (but more common) specimen? Which version would YOU be most interested in seeing?